MKMVA members say they should be recognised when the municipality is hiring as they fought for liberation. 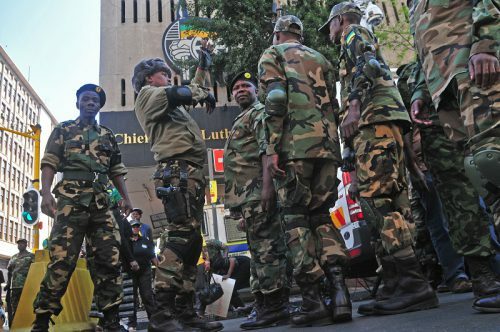 A number of uMkhonto weSizwe Military Veterans Association (MKMVA) members staged a sit-in at the Msunduzi municipality offices in KwaZulu-Natal on Monday demanding jobs and tenders. Municipality staff members were told they could not leave city hall premises by the military veterans who arrived just before 8am. After over an hour, staff members were allowed to leave after 10 am. The veterans were complaining about jobs and tenders, saying they also wanted to benefit from council activities, including getting jobs. They decried the alleged sidelining of veterans when appointments were made adding that they needed recognition as they had fought for liberation. “I have applied for a job in the security division and have not received any response from the municipality, yet I have experience in this field,” said one of the MKMVA members. He said the lack of response showed that municipal appointments were along crony lines. Msunduzi Mayor Themba Njilo confirmed that he had met with the MKMVA leaders and received a set of demands. The meeting was attended by acting city manager Nelisiwe Ngcobo and security head Kwenza Khumalo. “When it comes to tenders the municipality has a supply chain management policy and we cannot do anything outside of it,” said Njilo after the meeting. Veterans disbanded and left city hall after learning that some of them were likely to receive appointment letters later in the week. Monday’s sit-in follows a similar one on July 25 at the offices of uMgungundlovu District Municipality where veterans made the same demands.